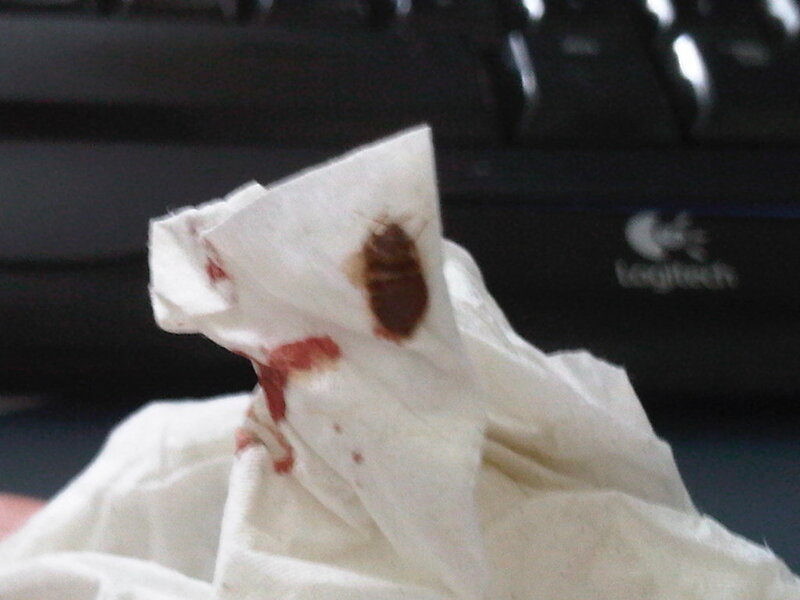 Our Bed Bug Experience - Been There...Did That...and Lived to Talk About It! My name is Melanie, and I'm here to tell you that if you have bed bugs you can get through it. How do I know? I've been there. I've done it. In 2011 we had a major bed bug infestation in our home. I want to share our experience with you so you know that you're not alone in what you're going through and that it is absolutely possible to overcome a bed bug infestation - even if you have no other choice than to do it yourself. For us, it was a roller coaster ride of emotions and strategies: denial...desperation...education...well-planned action...and ultimately...victory! 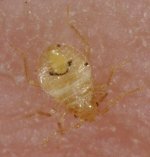 If you educate yourself in the bed bug basics and use integrated pest management principles, you can most certainly get rid of a bed bug infestation too. “It couldn't possibly be bed bugs”, I thought - or hoped. Here's a picture of one of the bugs we found early on. Yep, that's my husband's blood on the tissue. So, I went into our home office and did a quick search to find out something that would prove my point. Suddenly, I was hit with that terrible sinking feeling in the pit of my stomach. My denial turned to fear, as I realized that we did indeed have bed bugs. What kind of place are we living in? My Solution? Go completely nuts researching it to death. Actually, that's my solution to just about any problem that rears it's ugly head. Okay. I'll admit it. I’m an information junkie. I learned that having bed bugs didn't mean we'd moved into a rat-hole of a place. They don't discriminate and they're not dangerous - good news! I also learned that we were living in the 3rd most bed bug infested city in America, and that getting rid of them was a lot easier said than done - not so good news. Were they there when we moved in? Did we bring them home from a recent trip? How on earth were we going to get rid of them without it costing us a small fortune? Most importantly, how long was it going to take to get these annoying little pests out of our home? After days of endless research, I had replaced my denial and fear with a complete sense of overwhelm at the complexity of the situation, the wide variety of treatment methods, and seemingly contradictory advice. If there is such a thing as over-analysis paralysis, I had it for sure! What should we do first? Which treatment options should we try? Where am I going to get all this stuff?! 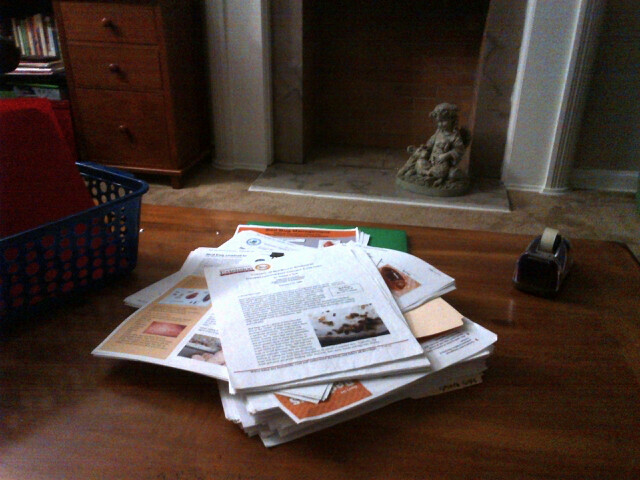 This is a picture of the pile of bedbug research I printed out from everywhere imaginable. Enough to make anyone a little crazy! Did I mention I might be a bit info-obsessed? Please understand me. I'm not recommending this by any stretch of the imagination. We were very strapped for cash. We had recently moved, but our previous home had not sold yet. Two properties, two house payments, and a tanked real estate market. Need I say more? Lots of things that seem like common sense are wrong. And they can make things a LOT worse. Successful bed bug pest control requires careful planning, using multiple techniques together, and having clear understanding of what works, how it works, what its limitations and risks are, and how to use it properly. It took a few months of persistent work (we made a few mistakes early on). But we did win the battle. And thankfully, we've been living bed bug-free since 2011. I May Have Become a Bed Bug Geek... But you Don't Have To! Information that's not critical, but may be of interest to people just doing research (or the nerdy "I have to know it all" folks like me) can be found in special "Technical Stuff" call-out boxes like this. Just to be clear here, I am not an expert. I'm neither a scientist nor a pest management professional. And I am definitely not some sort of guru. Just a regular person...with naturally geeky tendencies...that kick into high gear when I'm faced with a problem. It's part of my coping mechanism. Prior to our infestation in 2011, I never dreamt that the words "one of my favorite entomologists" would ever come out of my mouth. I'm not sure I could have even told you what an entomologist (insect scientist) does back then. And I certainly wouldn't have guessed that I would still be keeping up with scientific advancements and innovations in pest control today. The good news is that there have been some major improvements in the tools and techniques for getting rid of bed bugs have since our battle 2011. The better news is that my nerdy-ness is your gain. You don't have to wade through pages upon pages of government publications and jargon-filled research documents to get the help you need. The goal of this site is to to make the critical information about bed bug prevention, detection, and pest control as accessible and digestible as possible, then provide links to reliable resources for more information where you might need to go deeper. Whatever part of the journey you're in, please know you're not alone. And rest assured, your situation is not hopeless. If you take the time to get educated so you avoid making critical mistakes, it does get better. I promise! Dealing with bed bugs is stressful, and it can be very isolating due to the perceived stigma associated with them. A safe place to share what you're going through really helps! If you are stressed out and need some support, I recommend the bedbugger forums.